People tend to have two ways that they approach artificial intelligence. The first is that they see it as a wonderful technological advancement, something that can help humanity automate much of its drudgery and make life easier. The other school of thought has been the Terminator movies, and has no interest in surrendering to the robot overlords. Whichever group you belong to, AI is here to stay. Most people tend to associate AI automation with physical jobs like construction or manufacturing. If you’re in media, you might think you’re safe from automation. Here’s the wonderful truth: even media and content creation is becoming automated. Heliograf, the AI technology owned by the Washington Post, has already authored plenty of its own articles. And there are a bunch of new companies that are building their business out of AI-created music (supposedly it’s pretty good). On the latest episode of Should I Start a Podcast, I spoke to Chris Krimitsos. Chris is founder of the Podfest Multimedia Expo and produced The Messengers: A Podcast Documentary. He’s also involved in approximately 1,000 other businesses. 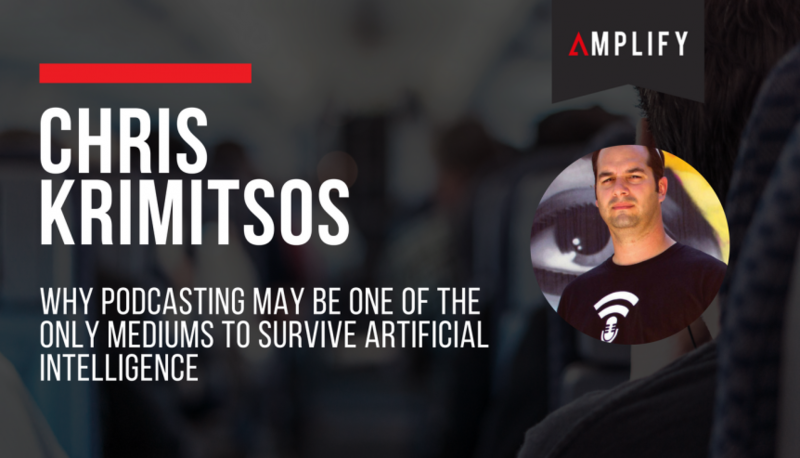 During the show, Chris explained that podcasting, believe it or not, is one medium that will likely never be changed by AI. This is because even if AI voice technology becomes indistinguishable from humans, they’re probably not going to be able to conduct highly-flexible interviews in the same way a person can. While text, video and music are about to be automated (at least to some degree), creative elements based on the human voice are a great area to invest your time into. Still, you should probably be watching the progress of AI. Chris recounted an anecdote from Gary Vaynerchuk. Gary V., as he’s commonly known, was explaining that there is a difference between luck and a lack of preparedness, especially in business. If your house is hit by a tornado and is destroyed, that’s bad luck. There’s not much you can do to prepare before that. But if a new trend in business comes and wipes your livelihood out, he says, that’s entirely on you. It is your job as an entrepreneur to be watching the news and predicting how things are going to change. It’s a scary thought, but incredibly sobering. Don’t be unprepared. Listen to my entire conversation with Chris Krimitsos here.